Even in ancient times people used animal fat, hibernating. It accumulates biological substances that provide the animal for a long time sleep normal life without water and food. Bear fat is a natural healing medicine and what does not in comparison with other drugs created artificially by chemical means, it is not. Bear eats plant foods (roots, bark) for which people do not pay attention. Therefore bear all the vitamins are fat, micro-, macro and other components. Bear fat is a panacea for many serious diseases: tuberculosis, darkening on the lungs, chronic bronchitis, including smokers, marasmus (regardless of factors), the initial stages of silicosis, some types of asthma, atherosclerosis, gastric and duodenal ulcers, normalizes hemoglobin , the activity of the intestine, increases the potency, heals and a number of other diseases not mentioned above. Miraculous healing drug. Natural complexes of all the components contained in the bear fat, in an easily digestible form, can penetrate intact into the cell to recover in its core mechanism of DNA repair, replacing obsolete.Bear fat has a bactericidal effect on tubercle bacilli. Normal secretory activity of the stomach and intestines, improves the emotional tone of the body. Repaid suppurative processes, close fistulas and hearths, cleaned the wound and the body is to recover. It is recommended to wash down with bear grease decoction (extract), hips or St. John's wort flowers. Bear fat can be mixed in a ratio of two to one with natural bee honey or black currant jam. Especially for the reception children who are encouraged to drink a warm milk. Ingestion adults: mixed with honey and 1 tablespoon twice a day (morning and evening) for 10-15 minutes. before a meal, without honey - a third less (teaspoon). Children - in proportion to age. Outer: smearing bandages, wipes bandage once a day, with pre-treatment of wounds, ulcers, lesions. 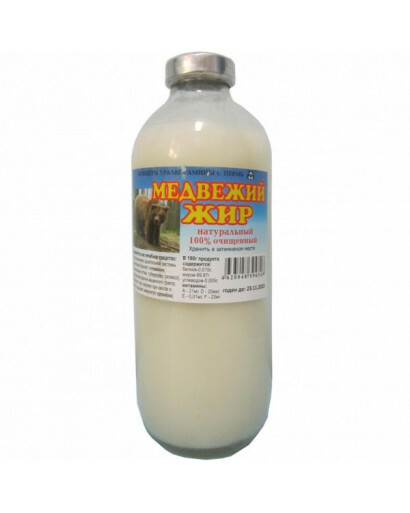 Bear Fat for hair beauty - The secret of Cleopatra. 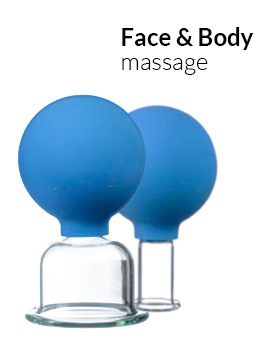 Since olden times Bear Fat has been valued as one of the most effective medicines. It was particularly popular in the Nordic countries, where it was helping to cure severe colds, pneumonia, tuberculosis, rheumatism and to correct the lack of vitamins in the winter. The healing properties of Bear Fat are not only confirmed by the centuries-old practice, but also in research, that has revealed to us a unique composition and medicinal properties of this product. There are legends saying that Cleopatra used Bear Fat to make her hair shining and her skin to be smoother and more radiant. Why is the Bear Fat so useful? There are some unique compounds in the Bear Fat. The ration of a bear is very diverse, it includes: plants, berries, roots, nuts, fish, wild honey, meat of wild animals. The nature has decreed that the Bear Fat is a concentrate of nutrients. It is because of the unique composition of fat that a bear can spend 5 months in hibernation without getting any food or water. Fat components not only ensure the work of all the organs of the animal (the work of the heart, lungs, etc. ), but also do not allow the bear to freeze. This is a really unique source of nutrients. One of the most important components of the Bear Fat is polyunsaturated fatty acids. They are needed to lower blood cholesterol, to cleanse the body of toxic substances and heavy metals, as well as for normal functioning of the endocrine, nervous, reproductive or other body systems. 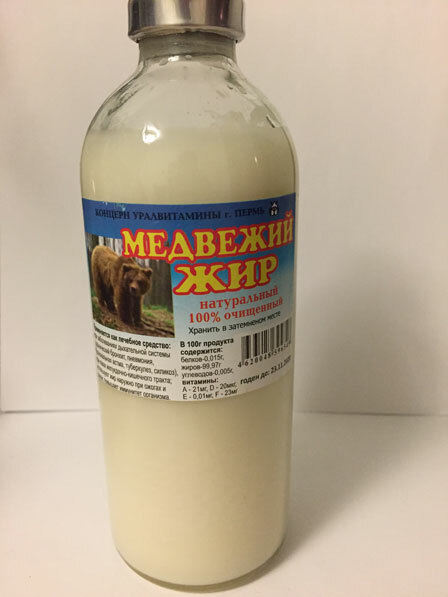 Where to buy a real bear fat? You can buy a natural product in those countries and regions where bears are found in large quantities, where hunting is permitted and this is an integral part of the life of the local population. I offer you to buy fat produced in Siberia, Russia. The manufactures get the raw materials from the hunters, process and bottle it. Men can successfully use this mask for their beards. Mix 1 tbsp. of the Bear Fat melted on a water bath with 1 tbsp. of honey. Add 15 drops of orange essential oil and 10 drops of cinnamon essential oil to this mixture. Apply the mix to the roots of hair for 1.5 hours before washing it.